Because this is a comic series, the beginning of all of these reviews is going to begin the same with a short reaction to this edition in specific at the end. If you like mythology and beautiful art and celebrity things this is the comic for you. 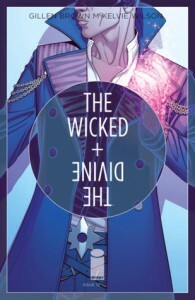 The Wicked + The Divine follows a group of gods from all the Pantheons who reincarnate once every 80 years. In this incarnation they're all musicians. You can clearly see the influences of certain stars on certain gods and goddesses, but some of the gods and goddesses don't even KNOW that they are yet. The main character is a woman of color (which I love), and the storyline feels so real, very similar to the Harry Potter world where you really felt like it could exist currently. This issue: Slower than the others, but never ceases to amaze me. I think I got spoiled by reading so much Gillen/McKelvie partnerships right away because...this..this is pure magic.